Primum non nocere: (the Special Forces Medic’s motto) First I Shall Do No Harm. First and foremost, know your limitations, both from a medical abilities perspective and also from a legal perspective. Many times first responders with no medical training have been hung out to dry legally when courts ruled the “Good Samaritan” clause holds no water. Also remember that all of the information in this article is for informational purposes only and that Ready Nutrition and its writers and staff do not advise any course of action herein. This article is not meant to diagnose, treat, prescribe, or recommend any activities outlined. Only your licensed, certified physician is qualified to perform any of the actions entailed by this piece. Know your limitations. Do not make things worse. Humility is just as important sometimes as courage, and humility is a form of courage, the courage to admit the truth to yourself and defer your limited knowledge and abilities to someone more capable than yourself. That being said, we are talking about life over limb, here, and there may not be time to transport your patient to a hospital. He or she may not make it that far. You may be the health care first aid provider. Assess the patient first. Bandaging and splinting involves first assessing the needs of the patient. You must first assure yourself of Airway, Breathing, and Circulation. Do not let the sight of the blood throw you off! Many has been the failed candidate in a trauma class in Special Forces that has treated the amputation in a trauma clinic, only to find that the patient had no airway and was not breathing before the amputation was even discovered! Make sure your patient is breathing and has a pulse. The phrase we want to emphasize next here is Stopgap. It holds a meaning just as it sounds. Stop the bleeding and close the gaps. Small cuts you can use a band-aid or a small bandage. Seeping or slowly flowing bleeders need a larger bandage or even a pressure dressing. A pressure dressing is where you bandage the laceration/cut and affix the bandage firmly. Overtop of the dressing, you place a folded up or balled up cravatte, and then tightly bind overtop of the fold/ball with another cravatte, making sure that it is tight but not too constricting. You want to stop the flow of blood from the wound without cutting off his circulation. You must then assess distal circulation. This entails checking the circulation away from the wound (away from the patient’s trunk), and this is especially true on the limbs. If your patient has a laceration (a tear) on the forearm, you must place the bandage and then assess his circulation distally: check his radial pulse (in the wrist), and then squeeze (gently) one of his fingernails. This latter will cause the nail bed to turn white, and with sufficient capillary perfusion (the flow of blood to the extremities of the fingertips), the blood will return in about 1-2 seconds. This is referred to the check “cap blanch” and is part of assessing the circulation. If you do not find these two circulatory tests to be satisfactory, you should reassess the dressing to make sure it is firm but not on too tight. You want a bandage, not a constricting band or a tourniquet. Regarding the latter, the tourniquet is the last resort. Keep these words in mind! The reason for this is simple: the tourniquet can kill a lot of healthy tissue in its employment and will make reattachment of the amputated limb much more problematic. The tourniquet (say, on an amputated leg or arm when the arm is near the shoulder) is used only when blood flow must be stopped or the patient is in danger of imminent death! One must be very careful when a fracture is involved because of potential fatty embolism. This is when globules of fat or marrow become pressed into the circulatory system and can travel directly to the heart, knocking it out. Your tourniquet should be kept tight but not so tight as to cause further pain or discomfort. The tourniquet should be slightly loosened and then retightened every ten to fifteen minutes to prevent tissue necrosis. This condition is to be found when tissue dies (hence becomes necrotic) because of complete loss/lack of blood flow. In the Army, we marked such an amputee patient with a black “T” on the forehead, so the definitive care treatment (secondary aid station) would know off the bat that a tourniquet was involved. If you can clean off the site prior to bandaging, then do it. Also, be sure and cleanse your hands with soap and/or sanitizer prior to working on your patient. Listerine comes from Dr. Joseph Lister who showed the importance of washing the hands in a first aid and surgical setting. Another rule to follow: Use the bandages the patient carries before using your own. Each of you should have a first-aid kit that it standardized when you undertake an excursion, and each of you needs to be trained in its use. 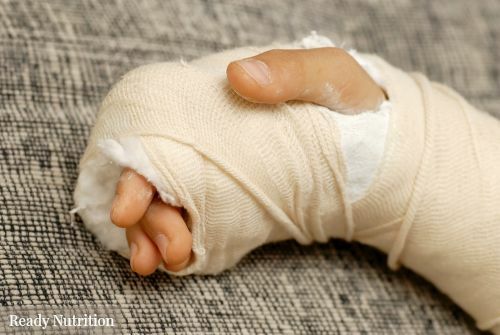 In the next part of this module, we’re going to discuss field-expedient bandages and also start into the basic fundamentals of splinting a fracture. In module part 3 we’ll deal with some other niceties, such as impaled objects, eye injuries, and burns. So remember, readers: first, do no harm, and when you’re sure of this? Do the best you can…first to take them to a doctor, and if there’s no time…make sure they make it to the doctor. Complacency and indecision can kill just as easily as the wound. Be safe and have a great day. Keep an eye out for Part 2, coming to you shortly.